Meeting skills are often overlooked as an important part of an effective management committee, trustee board or other group meeting with a purpose. Frequently, meetings become ineffective, boring, unproductive in ways that can be addressed through considering the meeting skills of all involved in the meeting. The Chair of the meeting may be considered ineffective or dogmatic or a 'control freak' or other such labels, while committee members are considered passive, 'freeloaders', apathetic etc. When this occurs it is almost always due to the ineffective meeting skills practiced by those who attend and the usual behaviours that arise in an unresolved conflict start to manifest - blame is allocated, destructive arguments occur, possibly even verbal abuse. Alongside this, attendance drops off, frustration sets in and the purpose of the meeting is called into question, sometimes even leading to a break up of the group and the meetings to stop. There are usually two main practices that lead to this situation arising although a range of different behaviours can contribute to this. The expectations of the Chairperson can often be that they are 'responsible' for the meeting and so other participants come to expect the Chair to manage everything from decisions that are made to dealing with disruptive behaviours such as interrupting, deviating from the agenda etc. "Couldn't ask for anything more. The course met our needs. We are better prepared for effective group participation." "Excellent. Just what I needed." "It was excellent and was most beneficial for me"
Sometimes this expectation is reinforced by the Chairperson themselves expecting to be the 'decision maker' rather than the facilitator and leader of the discussion. When these expectations combine, those that wish to have a voice at a meeting can start to feel disempowered and often then start to subvert the progress of the group either directly in the meetings by interrupting and objecting in a destructive manner, or by making critical comments about the meetings and other participants outside of the meetings. Such behaviours become entirely understandable when it is possible to stand back and look at the contributions all involved are making to this situation arising. Chairs feel under enormous, often insurmountable pressure when they are expected to 'manage' a meeting with no support from other commitee members towards making the meeting more effective. As a result they will often try to be 'forceful' in their management (as they are pretty much on their own) to compensate for this. Whose responsibility is it to ensure that a meeting keeps to the agenda? Whose responsibility is it to ensure that Committee/group members listen to each other and don't hold small discussions while an item is being discussed? Very often the answer is 'It is the Chair's responsibility'. But of course for an effective meeting to go ahead, all of the participants recognise that it is the responsibility of all present to ensure these things occur. The role of the Chair is to facilitate the expression of opinions of all present and to draw upon contributions to support the creation of ways forward by the whole committee or group, with as much shared commitment to this as possible. Often, where a committee or group is not working effectively there will be a Chair, and possibly the Treasurer or the Secretary who feel they are 'doing everything' while others 'do nothing' and the other members of the committee who feel apathetic, uninspired and not involved or listened to. Where a Chair believes their role to be the 'main decider' of important decisions that the committee has to deal with, this is likely to be the outcome. And, correspondingly, where comittee members have the expectation that the Chair is to be the 'crowd controller' rather than the facilitator of discussion, opinions and contributions, it also leads to this outcome. If a Chair assumes this role, what is the point of having a committee? If a group contributes to this expectation by not 'managing themselves' and how their meetings go, what else can be the outcome? Here is a link to a list of many different challenges and problems that can arise in the operation of a Management Committee and which CAOS Conflict Management can provide support with improving. So how does CAOS Conflict Management Meeting Skills Training help? Our Meeting Skills training helps committees and other groups meeting with a purpose to communicate more effectively, to create more effectively, to be clearer about their shared purpose, to listen more effectively and to achieve more from their meetings. 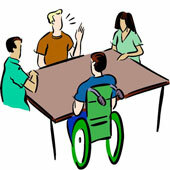 Meeting skills training is supportive but challenging, helping committee and group members to acknowledge that the 'fault' for meetings not being effective can only be shared rather than down to one individual, and the training helps participants to see that the cause of a group successfully achieving its aims can also only be shared rather than down to one individual. Meeting skills training has been provided to a range of community organisations, particularly Tenants and Residents Associations but also other community groups. Training from CAOS Conflict Management is always interactive and participatory, involving group work, pair work, role plays, sometimes games, discussions. All our training is experiential, rarely needing more than a flip-chart and pens and participant interest in order to provide excellent value for money. Please CONTACT CAOS if you have an enquiry about Meeting Skills Training or our other services.